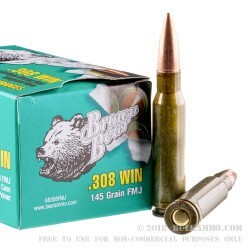 The brown lacquer on the outside of the steel cartridge casings of the Brown bear ammunition gives it the name. The performance that it promises with the reliability it is known for gives it the interest of consumers who shoot the .308 and who want a great deal on ammunition that would ordinarily cost significantly more. This is a well-known and popular choice for the .308 Winchester that is priced at the very lowest tier of ammunition on the market. It is not low tier ammunition in its performance though, and it is continuously offering high reliability and good accuracy for an incredible price. The ammunition featured here is quite accurate for the money, with 2MOA or less readily achievable out of standard rifles. You can get even better accuracy with the right experience and rifle and this makes it a very interesting round for range and plinking shooters. The inherent reliability of the Berdan primers and the decent projectile for general purpose use (a 145 grain full metal jacket) makes this a bargain. 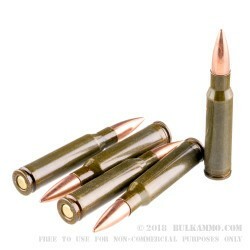 Be aware that these bullets are generally magnetic, and the bi-metal formulation may not be allowed on certain ranges. 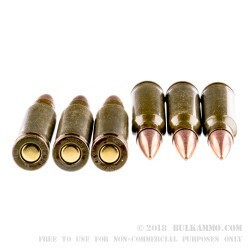 A: This ammo has a lead core with a bimetal jacket, which contains steel. The projectile will attract a magnet.